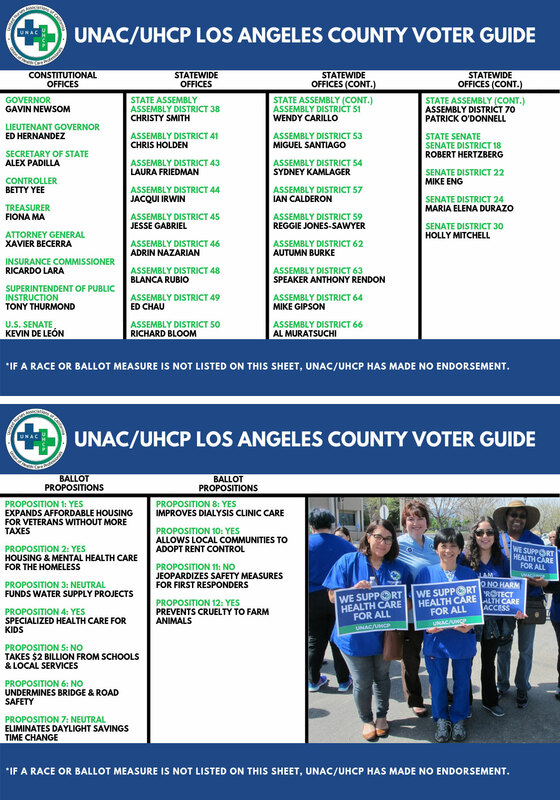 In preparation for Election Day on Tuesday, November 6th, we’re releasing our list of UNAC/UHCP endorsed candidates and ballot propositions for your consideration. 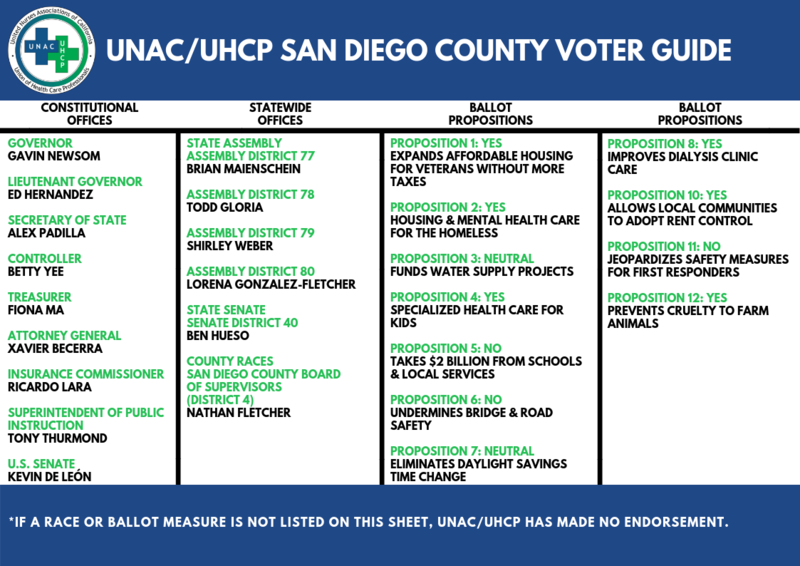 After the statewide primary election in June, 93% of our endorsed candidates advanced to next month’s general election. 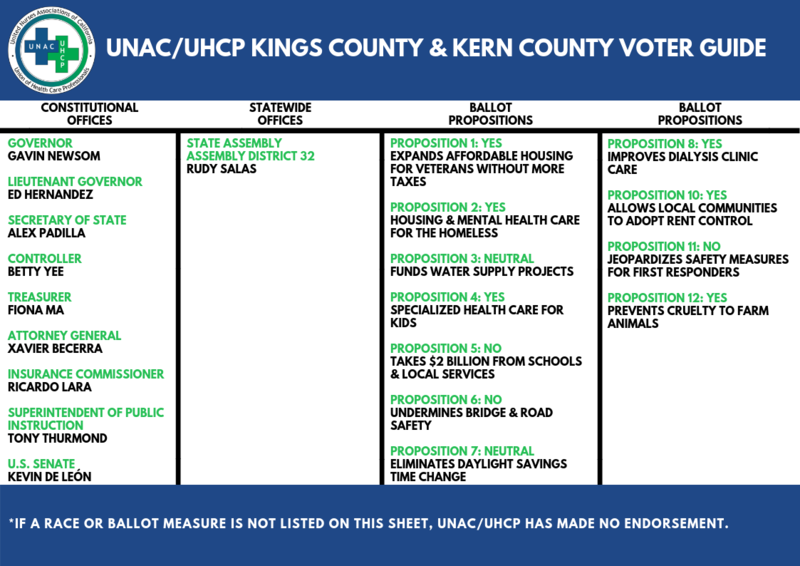 Our support of these candidates and ballot measures is determined by our member-driven Political Endorsement Committee, which meets regularly during election years to educate and interview prospective candidates about our issues as health care professionals. o Proposition 1 | YES: Authorizes Bonds to Fund Specified Housing Assistance Programs. Legislative Statute. 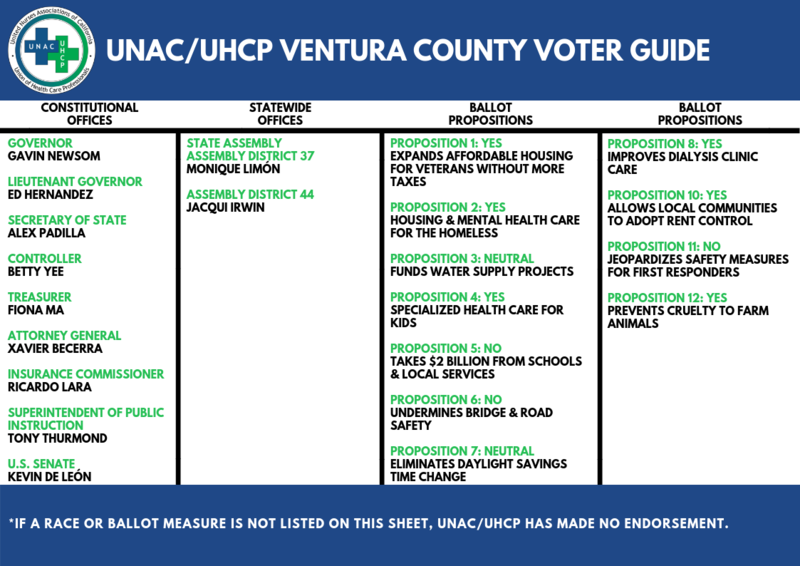 o Proposition 2 | YES: Authorizes Bonds to Fund Existing Housing Program for Individuals with Mental Illness. Legislative Statute. 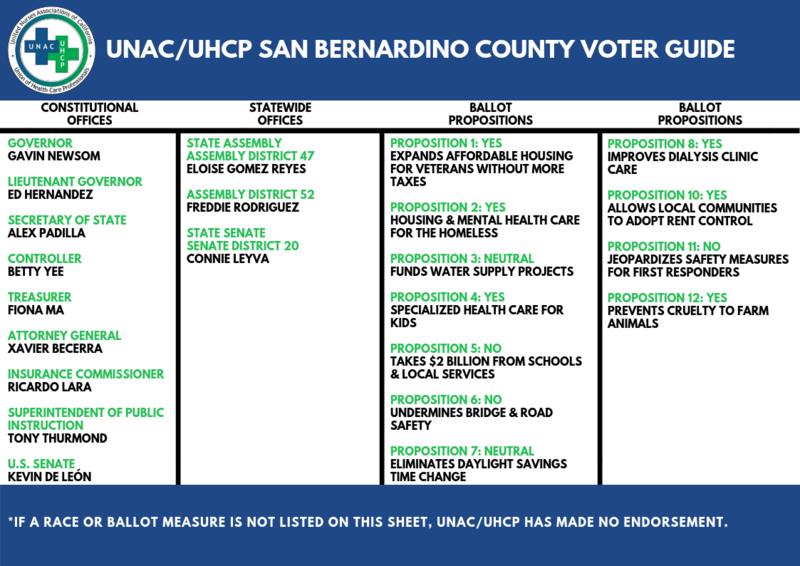 o Proposition 3 | NEUTRAL: Authorizes Bonds to Fund Projects for Water Supply and Quality, Watershed, Fish, Wildlife, Water Conveyance, and Groundwater Sustainability and Storage. Initiative Statute. 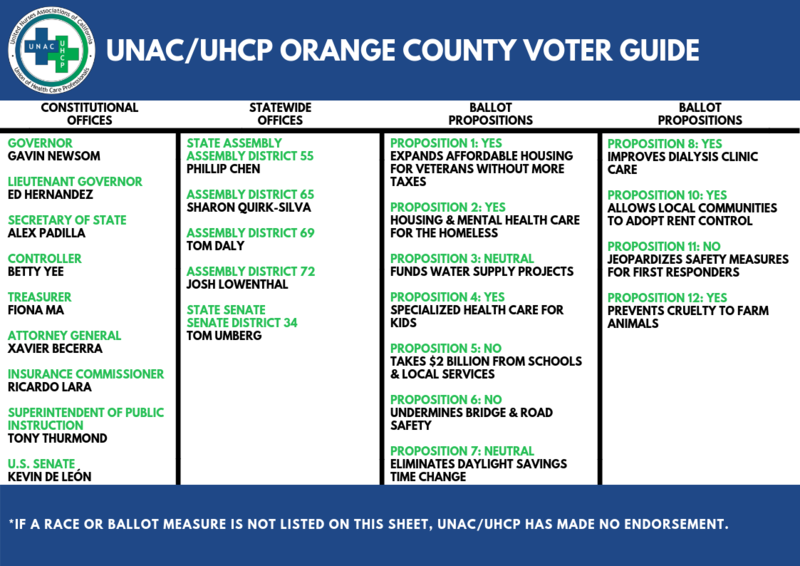 o Proposition 4 | YES: Authorizes Bonds Funding Construction at Hospitals Providing Children’s Health Care. Initiative Statute. o Proposition 5 | NO: Changes Requirements for Certain Property Owners to Transfer their Property Tax Base to Replacement Property. Initiative Constitutional Amendment and Statute. o Proposition 6 | NO: Eliminates Certain Road Repair and Transportation Funding. Requires Certain Fuel Taxes and Vehicle Fees be Approved by The Electorate. Initiative Constitutional Amendment. o Proposition 7 | NEUTRAL: Conforms California Daylight Saving Time to Federal Law. Allows Legislature to Change Daylight Saving Time Period. Legislative Statute. o Proposition 8 | YES: Regulates Amounts Outpatient Kidney Dialysis Clinics Charge for Dialysis Treatment. Initiative Statute. o Proposition 10 | YES: Expands Local Governments’ Authority to Enact Rent Control on Residential Property. Initiative Statute. o Proposition 11 | NO: Requires Private-Sector Emergency Ambulance Employees to Remain On-Call During Work Breaks. Eliminates Certain Employer Liability. Initiative Statute. o Proposition 12 | YES: Establishes New Standards for Confinement of Specified Farm Animals; Bans Sale of Noncomplying Products. Initiative Statute. 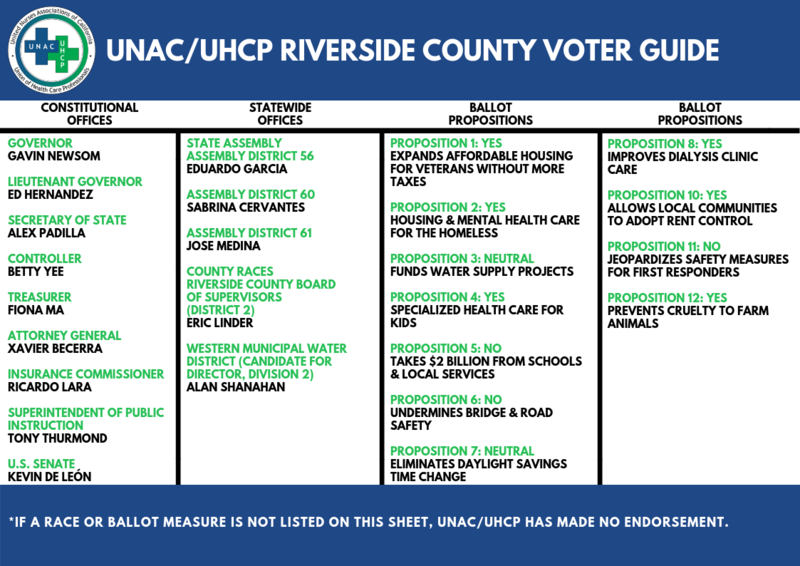 For local candidate endorsements and ballot proposition recommendations, please click on your county below to view the local voter guide.